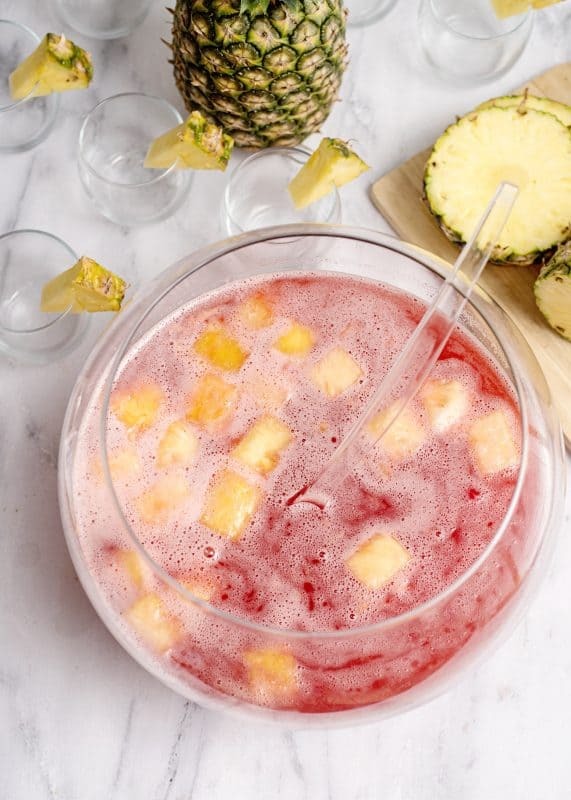 Learn how to make this DELICIOUS party punch that my family enjoys on special occasions. Each time I serve it, I always get asked for the recipe! With New Years Eve upon us, I thought this would be a great time to bring you an old fashioned, super simple punch recipe that is suitable for everyone. My kids, our families, and our friends always enjoy this delicious punch whenever we have a get together. This is a I’ve been making since I was a teenager that is easily customizable. Today I’m going to show you how to make it using Splenda and Sprite Zero. 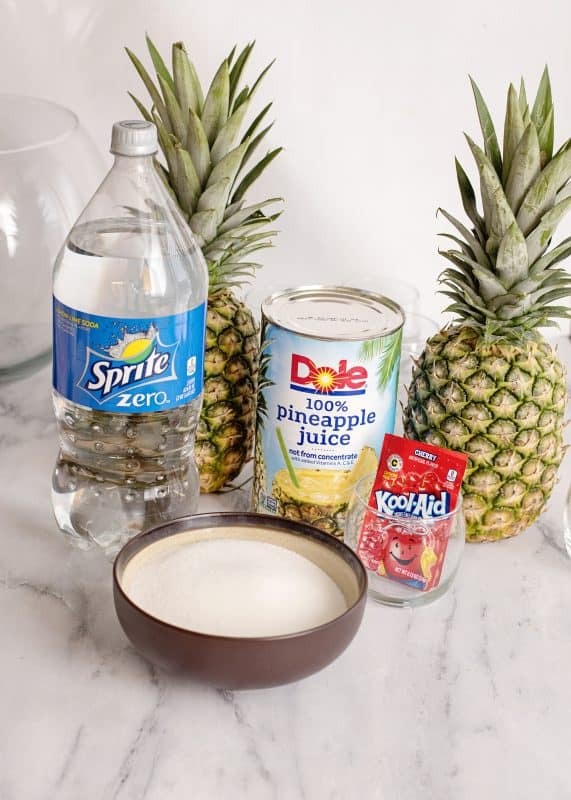 This significantly cuts out the sugar and leaves the only remaining sugars to be the natural sugars in the pineapple juice. You can also use full sugar Sprite (or 7-Up, or the like) and real sugar if you like, or an artificial sweetener of your choice (I love Ideal brand sweetener when I can find it). Now let’s talk about New Year’s Eve. I can tell you right now that I’ve got BIG plans with a capital B! You see, my mother always said that whatever you were doing at midnight is what you’d be doing all year long. So every year, like clockwork when that ball dropped in Time’s Square, I knew exactly where my hard working mother could be found: Snoozing away, dead asleep in her bed. My Mama has always been a smart lady. I’ve been out at midnight a handful of times in my life and have yet to find an experience that brought me more joy than avoiding the traffic and rawkus crowds and just snoozing away in the peace and warmth of my bed. OH! 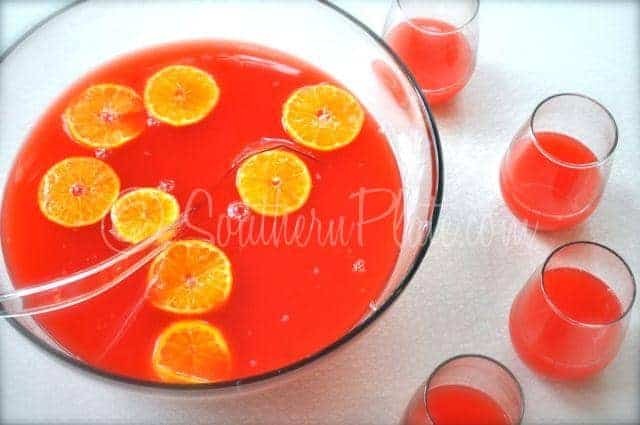 I forgot to tell you, the beauty of this punch is that you can change the flavor or color of it simply by changing one ingredient, and all that is required to make it is just pouring the ingredients into your punchbowl and stirring together. So you could head out today, buy the ingredients for this punch and a brand new punch bowl set for about $25.00. 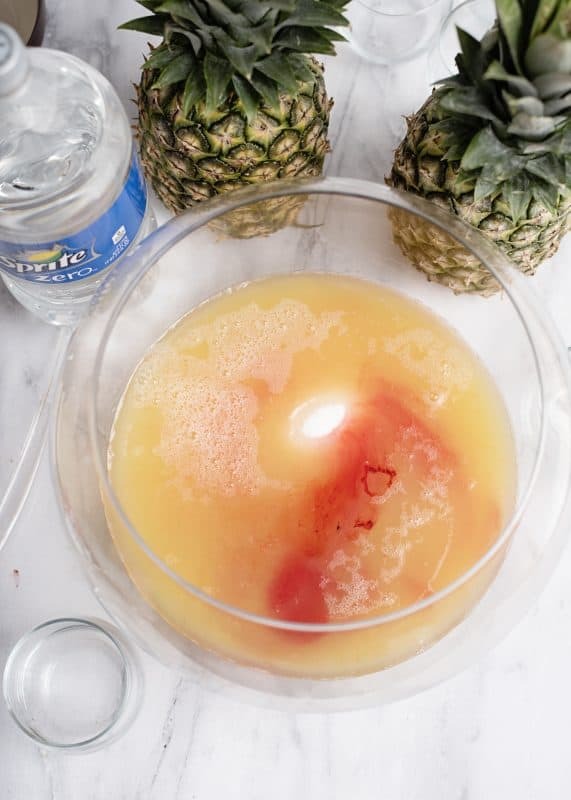 Pour your pineapple juice in a bowl. Add Kool Aid. Pour in Sprite. Gently stir again. At this point, you can add an ice ring if you like. Instead of an ice ring, I just refrigerate all of my ingredients so the punch is good and cold. To make an ice ring, I’d make some kool aid ahead of time in whatever flavor you are using for the punch and put it in a jello mold or bundt pan. Freeze until firm and then dip just the bottom into warm water for five seconds before releasing it into your punch bowl. Can serve over ice, with an ice ring in it, or just serve cold! You can garnish with fresh fruit if you like or just serve it over ice or in punch cups, as I usually do. It is absolutely delicious and you just have to taste it soon! 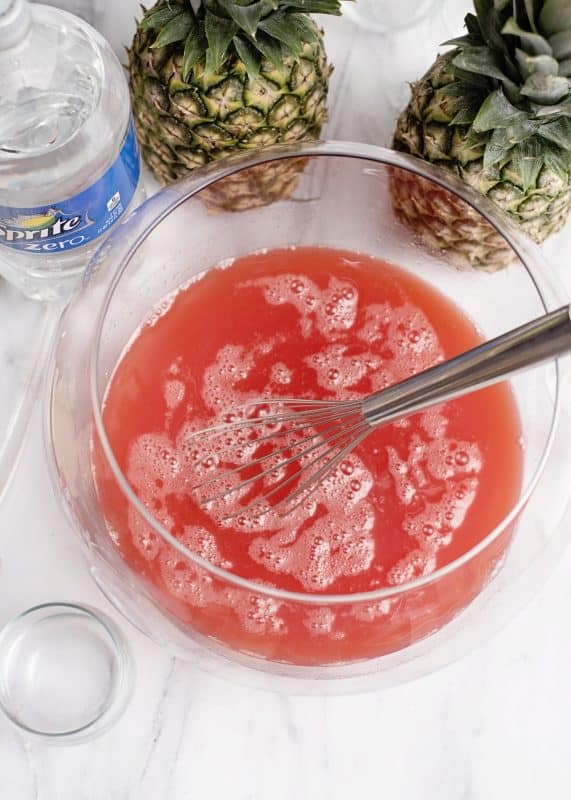 In punchbowl, pour pineapple juice. Add drink mix and sugar/Splenda. Stir until dissolved. Pour in Sprite and serve. *Can use 7-up, Ginger Ale, or other clear carbonated beverage of your choice. I keep my sprite and juice in the fridge so that my punch is good and cold and I don't need an ice ring. Submitted by Christy Ryan. Thanks Christy (love your name)! Submit your quote by clicking here. Christy, if someone’s kinda a clutz (like me), it might help to turn the ice ring onto a cutting board first. Then you can ease it into the bowl. I don’t know how many times I’ve plopped something into a bowl and had the contents splash all over everything (including me)! iI HAVE ALSO FROZEN fruit in fruit juie in a ring and floated it in the punch. 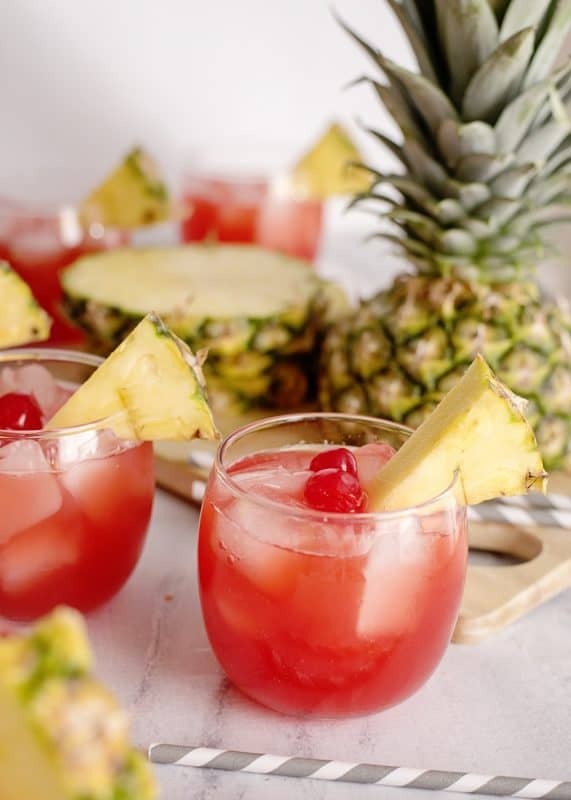 I used to make one that was almost like alcoholic but wasn’t and it was the pineapple. It had frozen pineapple concentrate, limeaide in frozen and had 7 up or gingerale and then floated some orange and lime sherbet in it. I don’t recall if it also had orange juice or not but I think it did. I had so much punch and shrimp once when I was getting a little flu and was sick for over a week and it was a couple of years before I could eat shrimp or drink the punch, but it was fantastic punch. I should try to find that recipe again. I usually put fruit juice in the ring and floated cherries and orange slices in it. They did melt and had fruit floating in the punch and the sherbet had a foamy liquid on the top and it was really good. The pineapple did give it a kick though. Makes me wonder if this one does too. However this is much less expensive as it doesn’t use the fruits and the sherbet. I don’t even have my punch bowl anymore. I downsized and I got rid of everything I had stored in the shed for a couple of years. I am going to try this recipe. I have a big Mexican Fiesta every year and I provide tea, coffee and water. I do allow guest to bring their alcohol drinks if they like. I think the kiddos will love this. I really don’ t care for alcohol but sure have no issue if someone does. You are so right, when I go to those functions there is only water. Happy New Year to ll the Jordan’s. You too Linda!! And BRAVO for you for providing so many options! Sounds like you are the ultimate hostess!!! I like wine, but my liver doesn’t so I drink maybe one glass at the most! I’ve never been anywhere that didn’t at least offer softdrinks for those who drink none or little. My sister always makes this punch and I would drink the ENTIRE container if it weren’t absolutely impolite!! And…AMEN to the non-alcoholic drinks!! Happy New Year!! okay so here is the real back story here…I made this twice this week so I could get more photos (we drank it too fast on Christmas day) and the second time, I just about did drink it all, lol! Christy, I’m with you on the alcohol thing. It seems be so accepted now and that one can’t even have a meal without it. I made a punch very similar to this for years at church — the only difference was 12 oz. can frozen orange juice concentrate (reconstituted) added and just one pack Kool Aid. I see folks occasionally from that church and they still talk about the “church punch”. So nice to have this to share and it seems to make an ordinary occasion a celebration when you serve it in punch bowl and cups! Oh I know! I honestly can’t imagine drinking alcohol with a meal. To each his own, though! There are so many great “church punches” out there, and the kids love that they get to have a special punch. You are so right!! BTW, universal time is Greenwich Mean Time which translates midnight GMT to 6 PM Cental time. That’s when we celebrate. I can have folks come over at 5 or 5:30 to mingle and have appetizers. We can ring in the new year at 6 and then sit down to our meal of peas and greens and cornbread with whatever we want to go with it. Everyone seems to like it and it’s become a tradition for us! So fun with older folks or young kids who often aren’t into revelry at 12 M Cental time. I know I’m not! I’m under the covers, fast asleep~! We like to serve this at my daughter’s birthday parties and just change the color to go along with the theme to her party! Thanks for sharing. Thank YOU!!! What a lucky daughter you have to have you for a mama! Good Stuff Christy Faye! Thanks! Thanks for the great recipe. I am going to be giving this one a try. I am right there with you about the alcohol for several reasons — we do not need it to have a good time, it makes you do stupid things, I have family members who are in recovery with years and years of sobriety, and most importantly, regarding my Christian faith, I would feel I am falling way short of where Jesus wants me to be. (I am just saying for me, what other folks do is between them and God). Anyway, thanks for the punch recipe. I will line this up on my island along with my Welch’s Sparkling Cider. 🙂 Happy New Year! I’m with you Christy – I’ll sleep the old year out and the new year in, if I can sleep. You younger ladies may find when you hit menopause that sleep is harder to come by, so sleep while you can. I’m inclined to agree with a statement my dear Daddy used to say too – “anyone up past 9 o’clock, is up to no good.” Lord knows I’m too old to be up to no good now. Some days it takes more energy than I have to get up to something good! Wishing each and everyone of you a joyful, healthy and happy new year. 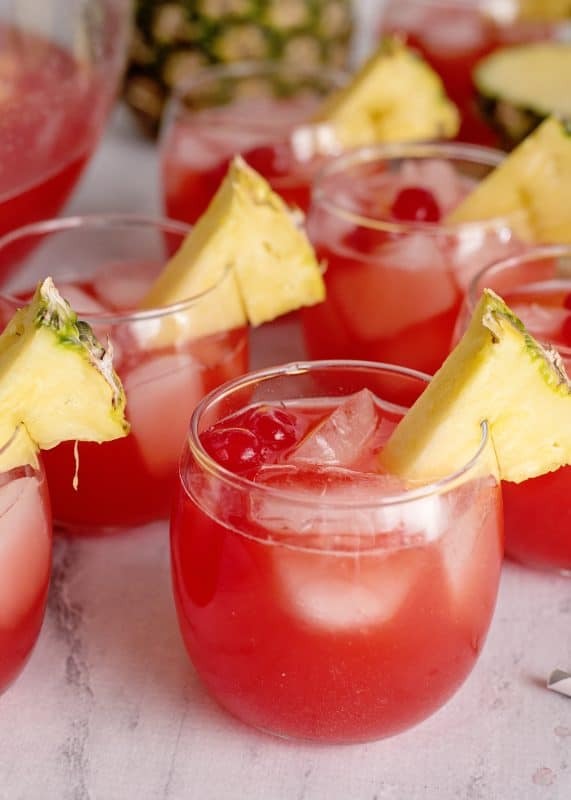 Love this Punch recipe! We drink mostly the generic brands of ‘Crystal Light’…whichever store brand you choose……so I am going to substitute 2 packets of one of those (omiting the KoolAid and Sweetener) when I host a large crowd (50) next month. Thanks for all the great recipes you share with us, and I wish for you and yours a VERY HAPPY NEW YEAR! Thanks for the punch recipe, I have never tried this one. We never know when the New Year comes in either, in the bed sound to sleep! Happy New Year! We’re hosting a family card party on New Year’s Eve….ok, maybe a few coins will change hands…..maybe we’ll make it to Midnight…maybe not! I am thirsty right now!! I’ve always called this “red punch” and have loved it ever since I was a little girl! I love punch! My aunt has always made a punch at our family get togethers. It’s similar to this only she adds rainbow sherbert to it.. I have made this punch for years but not usually on New Year’s. When my children were younger they each got to invite one friend (except the year when the boy my son wanted to invite had a twin, how do you invite just one?) to spend the night. I would make homemade pizza and other goodies. We would pile up in the living room and watch movies until midnight then we would stop the movie and watch the ball drop. My hubby and I usually turned in soon after and who knows how long the children stayed up. What better way to spend the year than with family, good friends and good food??? I just wanted to mention that thrift shops often have punch bowl sets for under five dollars for the entire set. After the holidays might be a good time to get one as people often donate them rather than store them another year. Frequently one can get extra cups to supplement your existing set too. I LOVE THRIFT SHOPS. Elaine, awesome as always!! Thank you! The best part about this recipe is that you can make the punch as it is and then provide vodka or gin “on the side” for those who want to add it. No worries about having two bowls of punch and someone getting the ‘wrong’ one by accident! You know, I was just thinking about your idea of adding stuff and thought of something else. What if you had a bowl of frozen berries on the side that folks could put in their glasses instead of ice? oooh yum! One of my favorites is frozen grapes and bananas! Thanks for the recipe! I like the idea of the vanilla ice cream in the glass before ladeling in the punch. I bet that would be great! 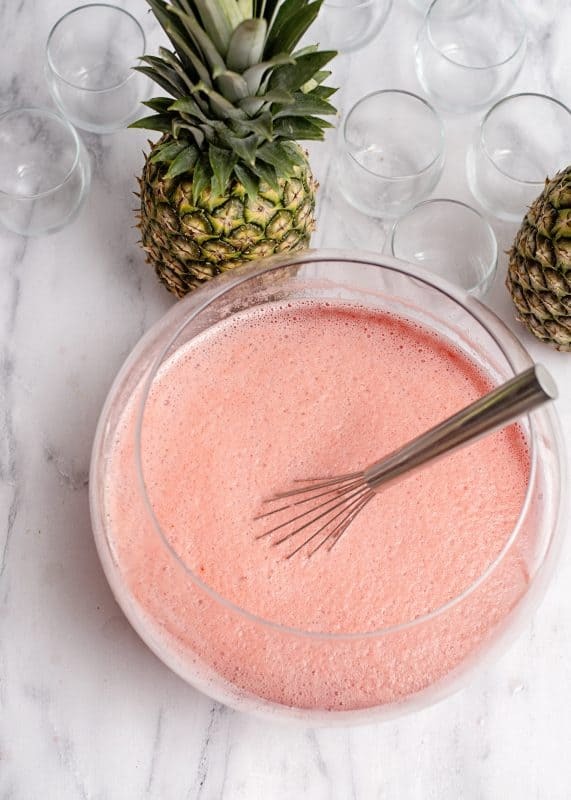 I don’t like the taste of alcohol, not even wine (shudders…), so this punch looks like it might be good. Whenever I tell my buddies I’m hitting the hard stuff, they know I’m into the Sprite, lol. This looks great! I like to make a punch with lime sherbert, pineapple juice and ginger ale…yum! I wish I had a big glass now. I make a similar punch for Christmas Eve, but it uses jello instead of Kool-Aid. Here’s the easiest part of keeping it cold. Make it a day (or more) ahead of time, ladle into zip freezer bags. I put one “batch” in 2 bags. I take them out a little while before serving, add the soda and you have wonderful icy slushes. My family like sherbet, so we add that. It is never leftover and I usually end up making more the next year. I make this same punch and put it in Gallon jugs in the freezer. Usually for 6 hours or until slushy. I shake it every couple of hours. We like it made with lemon-lime koolaide. When my boys were little they thought it looked like green slime ! Boy.. is it good! oh yeah, my recipe calls for 3 cups of water. I love this punch & have always used pre-sweetened kool-aid to cut back on sugar. I have also used Hawaiian Punch (gal size jug) instead of kool-aid. Thanks for acknowledging the need for non-alcohol drinks at a gathering. I recently hosted a gathering which included no alcohol. My husband and I are non-drinkers and felt that since it was a breakfast meal, alcohol could be excluded. I found it tacky that my guests brought their own alcohol and slipped it into their own beverages. ugh! I’ve got to agree with you there, Janice. My suggestion of alcohol on the side is for parties that are “mixed” drinkers and non-drinkers, including kids. But to bring your own to a party that is specifically non-drinking, and at breakfast even, that is just plain tacky. We’ve served a great punch during the holidays–very simple. Put vanilla ice cream in a punch bowl. Add eggnog and sprinkle a little nutmeg on top. You couuld use lighter ice cream and the light version of eggnog. So simple yet so decadent-tasting. Hey Gina! The Koolaid gives it a wallop of flavor but replacing ice cream or frozen yogurt would give it mostly a different texture and little bit of flavor. It wouldn’t be the same recipe, but I do think it would still be good! I hope this helps! Another option is to find some dye free drink mix. I think an Earth Fare or sprouts type grocery store would have it. I’m not a Whole Foods gal but they may have something like that there, as well. Here’s another good non- alcoholic punch that my husband’s grandparents would serve at the holidays. They had 5 children and tons of grandkids and great grand kids and they always had the big holiday dinners at their house. They are no longer with us, so we make sure to serve this when we have Christmas dinner. It is very easy: 2 cans of frozen fruit punch concentrate and 3 two liters of ginger ale. I’ve made it with 1 can and 2 two liters before and that works too. I’ve taken this to parties before and everyone asks for the recipe. Kids and adults like it.